Human right is always an important factor to discuss and work on. The first and foremost right of all human beings is to live with dignity. All the individuals in society must have freedom of talk, get education, respect, shelter, safety and, right to work. Basically, the government of a country is responsible to safeguard the protection of all the people and ensuring that all individuals are getting all these advocates. Various groups of people work voluntarily for humanity. It can be in the form of NGO or a charity organization. Working for the needy and poor always gives peace and calm. Some people devote their whole life to working for the wellness of the poor and helpless people. Many non-profit organizations work for collecting charity for the helpless. These organizations are also based on proper functionality. And they are registered organizations. Charity organizations also contribute to the social and economic growth of a country. The charity organizations layout focuses on bringing motivation in the society. 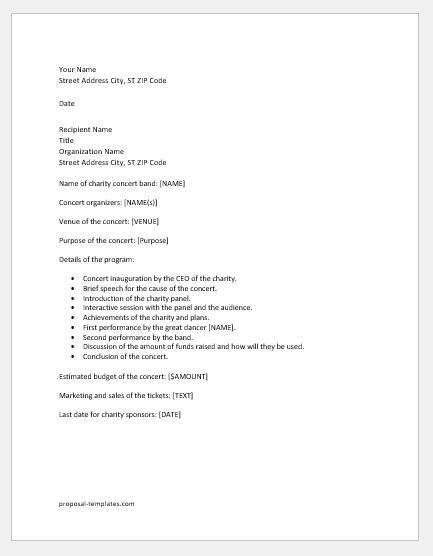 A charity proposal consists of the reason for conducting a charity event. It is being sent to the relevant company for requesting a sponsor. The proposal needs to be inspirational. A charity concert proposal contains the reason for organizing the concert. It aims for helping all the poor and the needy. The fundraising is done by buying the tickets of the concert. The letter also contains the details of all the sessions happening at the concert and how to achieve the charity purpose through the concert. We can never underestimate the love people have for their favorite bands. Due to this affection, the popularity of the concerts is increasing with every passing day. When the culture of concerts was trending, it was turned into a charitable cause as well. These days, it is considered one of the easiest ways to raise money. Charities collaborate with super bands to organize concerts and raise awareness for any cause and money as well. Concert inauguration by the CEO of the charity. Brief speech for the cause of the concert. Introduction of the charity panel. Interactive session with the panel and the audience. Achievements of the charity and future plans. First performance by the great dancer [NAME]. The second performance by the band. Discussion of the number [AMOUNT] of funds raised and how will they be used. The conclusion of the concert.